It’s not often that I get excited about a keyboard controller. All the things that people care about like action, key size, the amount of knobs or faders, etc. on a device do nothing to pique my interest. My mind has been made up, and at this moment I’d like to say I only worry about two things: expression and usability. We all know the limitations of the old keyboard. It can only go two directions: up and down. Sure, some allow you to apply pressure and eke out, through aftertouch, the ability to control some other parameter, but unlike a guitar or a brass instrument, you can’t swap out something integral about its classic design and make it express itself in a different way. In the old days, a ribbon controller would attempt to do something else, but only that something else. 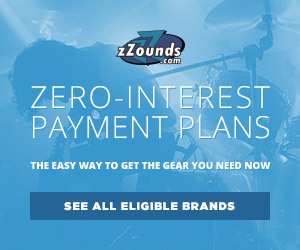 Now, the best you can do is go into other musical instrument realms. Maybe a pad controller, or a tablet device, and seek alternate ways to apply tremolo, or introduce modulation other than by tweaking a knob. Pad controllers allow you to change the distance between pitches — or the scale itself — in a way an 88-key behemoth won’t. A tablet device can provide access to X-Y parameters, or through accelerometers — something else to modify to an existing parameter. However, even those two devices are appearing to be their own instruments. Young kids or learned adults are training themselves in the the way of pad playing or interface drawing rather than pick up a keyboard to do so. For some reason the keyboard itself, one of our oldest instrument inventions, hasn’t evolved as much as the technology it controls. ROLI, though, has started to rethink its limitations and build something truly evolutionary. That’s what excites me. Doing away with the spring or pulley mechanism, it replaces our standard keybed with something resembling an actual bed. The entry point for those looking to investigate these new ideas is the RISE 25. What you see in its design is the change. Slim and covered in a synthetic, tactile surface that responds to pressure, tilt, and slides, the RISE 25 accepts that while its good enough to use as a keyboard device, it isn’t one. Doing away with the actual key itself, in favor of grooves and touch sensors is simply brilliant. How does it work? This is easy to describe. Say you have a violin patch. You want to mimic a violinist. However, a violinist, through one stroke, can control pitch (up or down), volume fluctuation (through pressure), and glissando (sliding from one note to another). Any change a violinist does to the sound is, more or less, seamless and organic. When a keyboardist tries do so, via a mod wheel or touch-sensing device they can sorta handle pitch and volume. However, to slide from each expression — particularly from one note to another — is the point where the illusion gets revealed. You can’t fake, or hide, the steps from triggering one mode of expression to the other. On a RISE 25 all you need to do is press the surface and slide the finger left or right to to glide through pitches. If you need to apply tremolo, you can slide and depress (or press) through one fluid motion the amount of pitch change you need. Do you need to do this on more than one note? Heck, it will do that through as many fingers as you can fit on it. Two low-friction ribbons complement this unique control by augmenting it with multiple glissando paths. I won’t go on to describe all the generous tools ROLI included to round out the device itself. 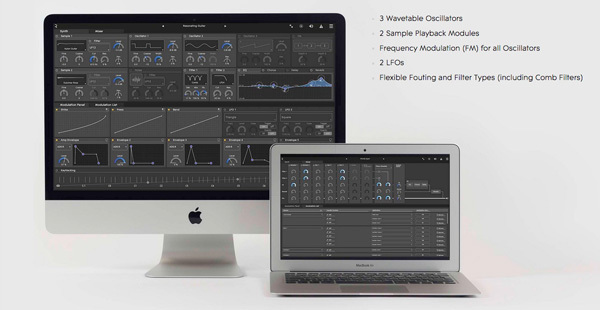 Items like their multi-dimensional synthesizer Equator which allows you to assign more parameters to different kinds of control mechanisms, or the touch-controlled MIDI control strips and X-Y pads add more kinds of value to the device. But, forget that. I’d like to highlight how ROLI has a unique vision to extend such expression elsewhere. That’s something their founders have an eye on implementing in other instruments (musical and non-musical) through their patented surface. For now, I can’t wait to see what they’re up to next. A shake-up like this is extremely necessary when other instruments like the Linnstrument are reimagining how much further the way we play can be open to experimentation and reimagining. I always like to cut to the chase when it makes sense. Let’s cut to the chase for this item. Why do you need an AKAI MIDImix? See that little button at the top right corner that says SEND ALL? that’s exactly why. What does SEND ALL do? It does one thing…it overwrites whatever MIDI CC values are currently on your DAW or MIDI receiving device with whatever you have exactly set at in your MIDImix mixer controller. We all know people, or we might be one of them ourselves, who like settings and mixes a certain way. In this modern world of digital mixing, who hasn’t opened up an Ableton Live Session, proceeded to tweak some virtual knobs, gone to the restroom, and returned back to find a cat/young child/ghost/Adobe Flash updates literally mess up what you had done on your screen? We can’t always prepare ourselves for when accidents happen, something made even more glaring when we reopen a session only to find that certain parameter changes weren’t recorded. On these occasions, is when the MIDImix is heaven sent — simply hit SEND ALL and watch those exact same parameters you had, before the accident happened, appear on Ableton. 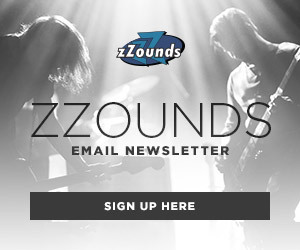 Forget about motorized faders, scene recall, cutsheets, etc. just good old-fashioned what you see, is what you’ll get. You don’t even need to an accident to happen to justify such a feature. There are people who love to mix with all the faders up and some all the way down. Nothing can be as time consuming as hitting up your friend’s crib and seeing him with all his faders down. If, you were a MIDImix user, all you’d have to do is take your controller with you and ramp up all your faders (if they weren’t already this way to begin with). Done with the Session? Cool, unplug your MIDImix take it home and instantly recall your last mix tweaks. Don’t even get me started the importance of such a button if you’re using a VST virtual knob-based sequencer like B-STEP. I know, these are all things for the neat-pickers, but in essence, these are all features you surprisingly don’t see in many mixing surfaces out there. 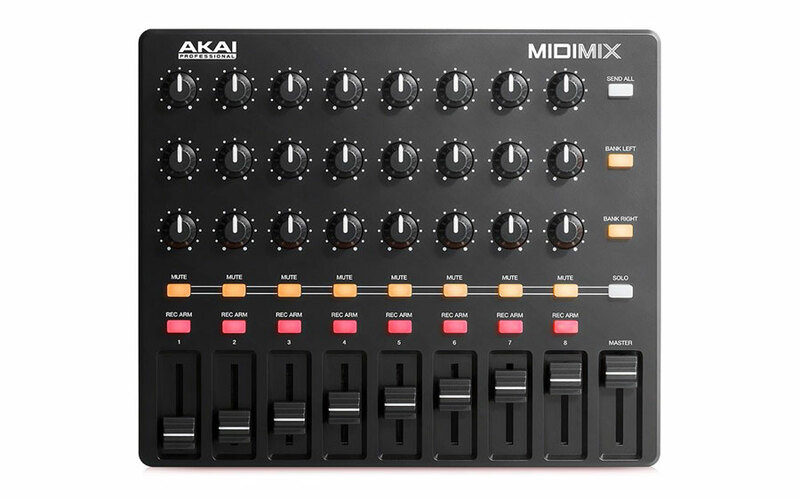 For all the bounce to the money ounce you get from the MIDImix, stuff like pre-mapped Live transport controls, bus-powered portability, 24 knobs and 8 faders in what is a device the size of a book…for me this is what would take the cake, over whatever is out there in its price range. 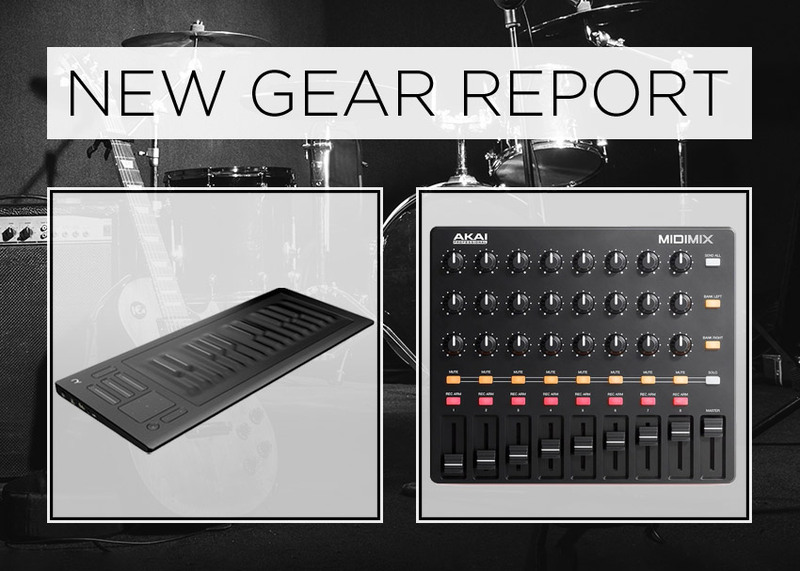 Again, at this price range, it would have been nice if there was some kind of hardware MIDI in and out, but it appears Akai is taking cues of heading in the right direction with their new line of MIDI devices. 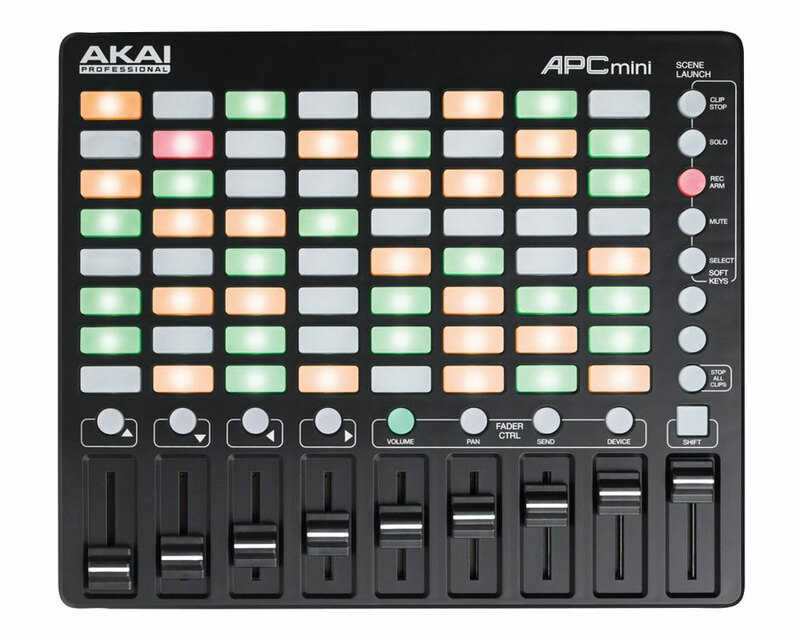 However, pair the MIDImix with the similarly sized APC Mini, and you’ve got yourself a pretty nice Ableton Live rig for less than the price of gaming console.